The first meeting took place at High Wycombe on 13th February 1972 with a total of 19 members present. The main decision taken was to hold an AGM in March 1973. In the same year National Working Breeds became the first Championship Show Society to offer classes for the Breed. The late Douglas Appleton judged an entry of 22 Pulis. The same society was also host to the first Puli Club Show, held in conjunction with their Championship Show in 1975 which brought an entry of 27 Pulis for judge Liz Cartledge. The first independent show was a Limited Show held on 6th March 1977 which was judged by Ruth Bumstead, one of the founder members and drew a super entry of 43 Pulis making 91 entries and on 17th October 1982 the first Championship Show was held, where the Club had the great honour of welcoming the respected Hungarian Judge and Puli breeder Mrs Sara Nagy. At the present time the Club holds two shows a year, an Open show held together with the Club’s AGM in February and a Championship Show in August. There are approx 150 UK members/households with 30 overseas members from USA, Canada, Hungary, New Zealand, Norway, Australia, France, Denmark, and Switzerland. 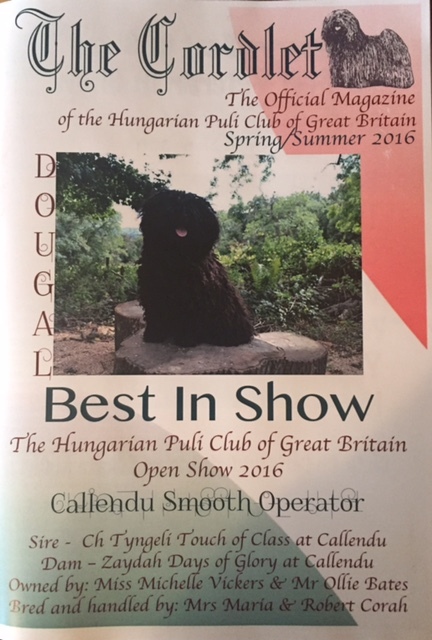 The Cordlet is the Hungarian Puli Club’s official magazine. Produced twice a year, The Cordlet’s content reflects all aspects of the Club’smembership: show results, health issues, news and views of members, club activities, fun stuff and pet articles. As the Club’s regular publication, both supporting and supplementing the Club website, it provides a permanent record the Club’s everyday activities for all subscribing members.